The Way We Use Information – We use the information you provide about yourself when placing an order only to complete that order. We do not share this information with outside parties except to the extent necessary to complete that order. We use the information you provide about someone else when placing an order only to ship the product and to confirm delivery. We do not share this information with outside parties except to the extent necessary to complete that order. We offer gift-cards by which you can personalize a product you order for another person. Information you provide to us to create a gift-card is only used for that purpose, and it is only disclosed to the person receiving the gift. We use return email addresses to answer the email we receive. Such addresses are not used for any other purpose and are not shared with outside parties. You can register with our website if you would like to receive our catalog as well as updates on our new products and services. Information you submit on our website will not be used for this purpose unless you fill out the registration form. We do not disclose anything that could be used to identify individuals. Finally, we never use or share the personally identifiable information provided to us online in anyway unrelated to the ones described above without also providing you an opportunity to opt-out or otherwise prohibit such unrelated uses. Our Commitment To Data Security – To prevent unauthorized access, maintain data accuracy, and ensure the correct use of information, we have put in place appropriate physical, electronic, and managerial procedures to safeguard and secure the information we collect online. Our Commitment To Childrens Privacy – Protecting the privacy of the very young is especially important. For that reason, we never collect or maintain information at our website from those we actually know are under 13, and no part of our website is structured to attract anyone under 13. How You Can Access Or Correct Your Information – You can access all your personally identifiable information that we collect online and maintain by calling us or sending us an email. We use this procedure to better safeguard your information. "As a bonus it smells fantastic." OMG I love this stuff. I bought it because I needed a pH neutral product for my marble and onyx bathroom tile. The first time I cleaned with the floor cleaner it seemed like I had never cleaned my shower before, it picked up a lot of dirt my other expensive marble cleaner did not get. 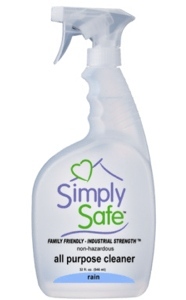 The all purpose cleaner worked fabulous on my glass shower door and walls. - Lori O.